Psychology students, staff, and faculty were well represented at last night’s Chancellor’s Honors Banquet! The Gene Mitchell Gray Pioneer Award recognizes a student or group for promoting cultural diversity and enrichment on campus. 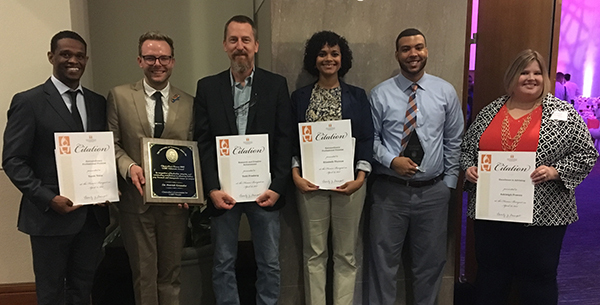 An outstanding PhD candidate in the Department of Psychology, Michael Oliver has made important contributions to UT’s diversity efforts. His doctoral research focuses on examining racial differences in aspects of well-being and psychological resources for combating stress. He has presented preliminary results from this research at regional and international conferences and is the first author on a wellness and diversity paper recently accepted for publication in the Journal of Health Psychology. Oliver has been a member of the Diversity Council in his department for the past three years, helping to implement components of the diversity plan. As a result of these contributions, he was asked to serve as a graduate student liaison for diversity issues. He also served as the graduate student representative on a biological psychologist search committee, where he helped members keep issues of diversity in mind during the selection process. Oliver is dedicated to mentoring students as both an academic advisor within his department and the biopsychology lab manager. Ashleigh Powers views each advising appointment with students as a teaching and mentoring opportunity. The care she takes with students is reflected in their growth, with one undergraduate noting that Powers “created a positive and secure experience” for her. Other students praise her vast knowledge as well as her “calm and funny demeanor.” Powers has served as coordinator of academic advising for the Department of Psychology since 2013. She also teaches Careers in Psychology and the Volunteer Experience. In her role as coordinator, Powers provides regular updates on the status of psychology undergraduates at monthly faculty meetings. She has been instrumental in forging alliances between professional and faculty advisors and works extensively with student advisees, helping them to adjust to university life, plan their course schedules, and find research and internship opportunities. In 2015, Powers won the department’s Outstanding Staff Award. The LGBT Advocate Award recognizes a faculty member, staff member, or student who demonstrates a commitment to advancing lesbian, gay, bisexual, and transgender issues on campus. Patrick Grzanka, an assistant professor in the Department of Psychology, has expanded traditional understanding of the range of sexual orientation beliefs by exposing how individuals possess multiple and sometimes contradictory beliefs about sexuality simultaneously. His research into the relationship among sexuality, science, and society has received international interest from major media outlets including the BBC, Fusion, and the Huffington Post and has been awarded funding from the National Science Foundation and the American Psychological Association. His work has major implications for how society promotes LGBTQIA+ equality in science and society. Grzanka is part of the steering committee for UT’s first program in women, gender, and sexuality, and he will teach its new introductory course. As the founding director of the Intersectionality Community of Scholars, he organized a campus-wide symposium and brought prominent LGBTQIA+ scholars to campus. He has acted as a thoughtful and empathetic mentor for students interested in LGBTQIA+ issues and has consistently spoken in opposition to legislation that discriminates against the LGBTQIA+ community.